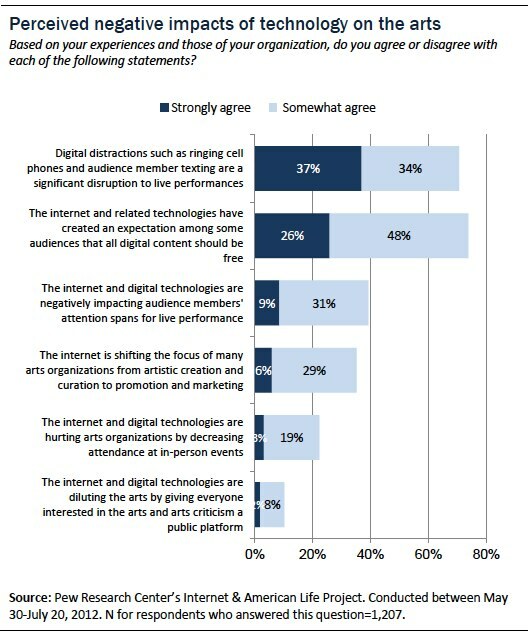 Yet at the same time, the majority of arts organizations surveyed also thought that mobile devices, ringing cell phones and texting create “significant disruptions” to live performances, and that technology contributes to an expectation that “all digital content should be free.” Survey respondents were split regarding their opinions of whether technology had negatively impacted audience attention spans for live performance, but they uniformly disagree that it has “diluted the arts” by opening new pathways to arts participation and arts criticism. Despite comments in open-ended responses, only 35% of respondents agree with the statement that the internet has shifted arts organizations’ focus towards marketing and promotion, and even fewer (22%) thought that the internet and its endless offerings are leading to a decrease in attendance at in-person events. Asked to forecast the impact that technology and social media will have on the field as a whole in the coming years, respondents mentioned everything from practical implications to broader, soul-searching ideas about the future of creativity. [We have the] ability to serve more people and at a lower cost. The internet makes it possible for our organization to market ourselves more effectively through online advertising, blog presences, and social media exchanges. We have been able to decrease our budgets and increase revenue by utilizing online resources effectively. For arts programmers, the access to high quality media to review artists in advance of assessing them live has been a huge step forward. Spotify alone has made it so much easier to get a first impression of an artist–no more waiting for press kits, accessing only what they’ve posted on their websites, etc. Last-minute ticket-buying and the trend away from traditional subscription packages will probably continue, as the internet has freed people up from having to plan for most event attendance far in advance. This will affect the predictability of revenue. On the positive side, social media has been a wonderful tool for word-of-mouth marketing. While it is impossible to know what internet and digital technologies will be like in 10 years, the trend of more information communicated more quickly to a more finely targeted audience with more immediate feedback from the recipient is likely to continue. We believe that this leads people to delay their decision-making about how they will spend their leisure time. For our field, this has generally meant a decline in subscriptions, a decrease in advance ticket sales, and an increase in last-minute box office sales. Moving beyond the practical, one of the prevailing positive themes is that technology increases – and will continue to increase – access to the arts. In some cases, technology is simply seen as a way to improve marketing and communication to get more “butts in seats,” but many respondents noted its power to broaden and deepen the audience experience. The digital world is a very populist force, leveling the world between rich and poor, educated and uneducated. In our case, an organization with a name like “Historical Society” has an invisible shield that bounces people who are below median income, do not hold college degrees, who hold blue collar jobs, who are a racial or cultural minority, off. The ubiquity of the computer, whether through your home machine, school, or local library, means that all of those things that cause discomfort don’t matter. That is a big deal! It has extended our visibility to many isolated individuals who may never have heard about our services, explored the artform, or who may have financial barriers to membership. We show to them every day what we do, rather than expect them to find a printed annual report and program summary. Social media are concrete and immediate examples of our living community in action. 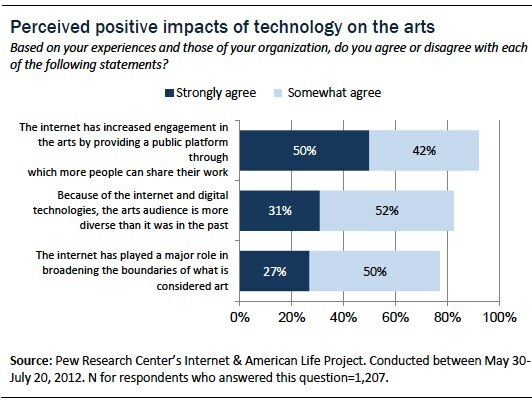 The internet and digital media provide an amazing opportunity for arts organizations to extend the impact of the arts. A live performance can be complemented greatly by opportunities for further engagement and education, and the ability to share information online maximizes our ability to provide these opportunities at a more in-scale investment ratio. We can reach many more people with an article or video than with a one-time lecture, for example. We are able to provide artwork that dates back more than 25 years to the communities we have worked with over the years. For many, these archives represent the only media history of their community. The use of the internet has deepened and expanded the access for our constituencies that are often transitional, without a landbase, or have been historically isolated due to geography. I think that it will greatly improve accessibility to the arts field – from a monetary standpoint and from a logistical standpoint. People who live outside of urban areas will be able to experience performances that are somewhat limited to large urban areas. Arts organizations will need to reconsider the level/type of interaction with their audience. The greatest impact will be the ability for non-profit organizations to share educational content and stimulating art and performances worldwide. It will also spark conversations between diverse communities and help individuals develop a greater understanding – and hopefully, a life-long appreciation for the arts. The internet will enable the performing arts to reach beyond a local audience, promote tourism, and make cultural arts created within a region accessible to the nation – and world. There is a powerful opportunity for the arts to create communities around performances, shows, exhibitions and their themes and history. For example, a Broadway show like ‘Next to Normal’ could (and probably has) created communities to discuss and share resources on mental illness. Continuing the transition from passive to participation, from hierarchical to democratic, from traditional media to online media, from single art-form to inter-disciplinary. The possibility to greatly expand and create a more diverse audience is very exciting because traditionally our audience has been older and whiter than the area we live in. Increasingly, we’re seeing some of our content getting traction in surprising nooks and crannies of the internet – which definitely means a shifting audience. The challenge will be for that audience to identify our content with the creators and the institution, and not simply have it exist as more entertainment or noise out on the internet. In the next couple of years, the role of mobile devices will only continue to shift how people curate their own experience and engage with artistic content. In radio, this presents an exciting AND daunting challenge in terms of our funding structure and station loyalty. These arts organizations realize that with these benefits come drawbacks. While digital technologies have led to the creation of ever-more dazzling tools and apps, many arts organizations worry about the long term effect on audiences, the field, and their very mission. People will have higher expectations for a live event. For audiences to invest the time and effort of going to a live performance, the work they see will have to be more engaging and of higher quality. Events will have to be more social and allow for greater participation and behind-the-scenes access. The event spaces will have to be more beautiful, more comfortable, more inviting and more accessible. The audience has already moved from “arts attendance as an event” to “arts attendance as an experience.” This desire for a full-range of positive experience from ticket purchase, to travel, to parking, to treatment at the space, to quality of performance, to exit – this will only increase over the next 10 years. The greatest impact of the internet on independent publishers will be audience expectations. Audiences will expect everything to be available digitally, and will require an engaging experience instead of a static one. Managing expectations. The internet and digital technologies are powerful tools. The public expects content to be free. There is a lack of awareness of the resources (funding and staff) that it takes to manage and preserve digital content. These costs will need to be passed on to users. Some ideas cannot be condensed into 140 characters or less. I hope technologies do not negatively affect the playwright. I hope the playwright does not write solely for a Twitter generation. Live performance will be diminished. Younger people don’t want to show up at a specific time, specific place for live performance — they want to download music at their own convenience. The power of live performance is lost and the civic convening – the community building is lost. I believe digital technologies are here to stay, and we as an artform should embrace them and learn how to work alongside them. We provide scripts to those sitting in our tweetseats, so they get the quotes right. We must work alongside or face alienating them. I believe that audiences will continue to have shorter and shorter attention spans and will insist upon being able to use smartphones and other devices in the context of a performance. As an industry, we should stop fighting and try to find ways to incorporate that reality into our daily lives. We will need to become much less tied to live, in person programming and certainly less ties to anchored seats in concert halls. Programming will need to incorporate much more personal involvement by the consumers or they will not be interested in engaging. As attention spans decrease, programming of longer works (e.g., Beethoven’s Symphony #9) will become more problematic. As we move forward, we may need to consider ways to embrace the digital, connected world to better engage live audiences or run the risk of making live music performances irrelevant. The greatest impact could be the expansion of our audiences, but the worst impact is the attention span of the moment of interaction. I worry that it may shorten our artforms’ performance times. Basically, we are competing for the “entertainment slot” in people’s schedules, and the more entertainment they can get via HD TV, Netflix, Video Games, etc., the less time they have for live performances, which also entails making an effort to get to the venue (as opposed to slumping on the couch in front of the HD screen). Also, movies, video games, etc., are both more convenient and cheaper than live performances. As the realism of participatory digital entertainment (video games, etc.) and the immersion ability of non-participatory digital entertainment (3D movies, etc.) increases, it threatens the elements that make the live arts unique–the sense of immediacy, immersion, and personal interaction with the art. We’ve long hung fast to the belief that there’s nothing like a live experience, but digital entertainment is getting closer and closer to replicating that experience, and live theatre will struggle to compete with the former’s convenience and cost. As a cinema approaching our fifth anniversary, we have seen significant audience growth in spite of the fact that many of the films we play are being released “day and date” on-demand. While streaming and piracy are increasing, we’ve been able to deliver the message that seeing films on the big screen with an audience is a singular, important cultural experience. I can’t emphasize the importance of the internet and social media in our marketing efforts enough. It’s most certainly a net positive value. As a film exhibitor, our challenge is to go through the digital convergence for projection and exhibition, a supremely costly change that doesn’t even have a long-range viability (these systems will have to be upgraded and/or changed every 3-5 years). Finding the revenue for these digital systems is an enormous challenge and threat to our ongoing activities. In the field of film production and distribution, more internet and digital access will result in far fewer movie theaters, as audiences have greater access in their homes to the medium. Already, as marketing dollars become more limited for films, production companies are shortening the movie lifespan in a movie theater and moving them to digital and television media sooner and sooner. Literature and the book are being very impacted by digital technologies due to the growing popularity of ebooks and to the influence of huge online booksellers like Amazon. There are both good and bad effects associated with these technologies. These days books are more easily accessible to a greater number of people however it is difficult for the book industry to produce a sustainable amount of income whether for individuals and for organizations. It is crucial that the public understand the importance of supporting nonprofit literary orgs, publishers, independent bookstores, libraries and other supporters of book culture and in turn it is crucial for foundations and government to provide this support. All literary magazines are in peril right now, so if magazines such as ours continue to exist it will be because of a paradigm shift in how literature is funded as an art form in the U.S. I am loathe to believe that print publications will cease to exist because they are still more beautiful, but all publishers will eventually have to create simultaneous digital and print editions, I imagine, which will make the whole enterprise more expensive. I believe that the more expensive arts producers ­– symphony orchestras, for example – will find it more difficult to draw enough audience to continue in the same manner they’ve operated for the past decades. Smaller groups will find it easier to adapt because they’re more flexible (they don’t require a large stage and hall). I am very concerned about losing some of the greatest music ever written — symphonic music — for this reason. For opera, it has made it more accessible, by providing low-cost performance broadcast of Met performances. This has increased the potential audience for our live performances. It is our companies responsible to promote effectively to those audiences. Overall I believe the effect is positive. It will radically shift the way in which we catalog and share information about collections; the museum as less the all knowing authority and more the conduit for rich institution-driven AND user-driven information. It will also allow regional collections the ability to link to similar collections worldwide – as such our local collections can be recontextualize and made meaningful in ways not possible without linked data and semantic web technologies. Digital technology and the resulting accessibility of information and images, while fostering accessibility of collections online, have the negative impact of diluting the desire of individuals to visit the museum to see works of art in person. Digital technologies have essentially made it impossible for book critics to support themselves in traditional ways; possibly the next 10 years will bring the shift of book criticism to academic world, where salaries are paid for teaching, and reviewing is a secondary activity. Twenty-five years ago, working critics had full time salaries from newspapers, magazines, other publications. Today there are only a handful of critics able to do this. Our chief concern for the literary arts is the increasing “validity” of self-publication among reviewers, readers, and writers. Online publishing and book sales through Amazon (for example) contribute to this problem. If there are no gatekeepers, it will become even more difficult to draw attention to works of genuinely high quality. The demise of daily and weekly newspapers and the increasing fragmentation of traditional radio and television media outlets combined with the increasing consolidation of media ownership due to revised FCC regulations has marginalized arts coverage and criticism to a point where it no longer plays a part in the larger civic conversation. Hence, it is becoming increasingly difficult to reach and engage potential audience members and arts participants, and has shifted the entire burden (and costs) to arts organizations that are ill equipped and unprepared to both engage in their traditional function (i.e., support the creation and presentation of art work) as well as build support structures to take the place of traditional media organizations. Digital technologies will level the playing field for all and old school, professional artists will be left behind. It is the advent of the amateur. For those who are savvy and ahead of the curve, there is money to be made if the content is strong. It means the complete reversal of a contributed based model founded on single funding sources and moves toward an earned revenue model and crowd sourced funding. Now more than ever, artists need to be entrepreneurs and not just artists. You can’t survive now as an artist unless you have a strong business model. [The internet] is becoming the major distribution platform for documentaries, which is what we do. The DVD will be gone in ten years. Artists are going to struggle to monetize their work on the Web. Access will be good for educational purposes and to increase awareness of the arts especially historical material in performance of all types. However, issues of copyright and payment for that material, such as in apps and in streaming or downloading, are murky and hard to navigate for artists themselves as to value and fairness of payments to the artist for original content. Digital technologies allows for students and artists all over the world to be inspired by one another. In some ways this is fantastic, in other ways, this breaks down the cultural differences that is so beautiful about having multiple countries involved in an art form. Materials we have that aren’t available digitally will be lost from the human record. Attendance at live performances will favor more fervent fans and those with disposable incomes who reside in cities, and the increased prevalence of simulcasts and livestreams will alter the viewing experience while also making it more democratic and affordable. Audiences will expect the digital presence of institutions to be well maintained and curated. Organizations will continue to need to adapt and incorporate digital technologies into their programming. This will be a good thing for art consumers and patrons by increasing accessibility and improving collaboration. At the same time, organizations will struggle with funding to keep up with technology. Funders so rarely fund some of the infrastructure necessary to create top-notch digital programming, and that will be a major struggle. But, technology has also disrupted much of the traditional art world; it has changed audience expectations, put more pressure on arts organizations to participate actively in social media, and even undercut some arts groups’ missions and revenue streams. Beyond the practical, the internet and social media provide these arts organizations with broad cultural opportunities. Comments in this survey reveal an array of innovative ways that arts organizations are using technology to introduce new audiences to their work, expose more of their collections, provide deeper context around plays and exhibits, and break down cultural and geographic barriers that, to this point, have made it difficult for some members of the public to participate. Their responses suggest that the majority of these arts organizations, with enough funding and foresight, are eager to use the new digitals tools to sustain and amplify their mission-driven work.